Oh hey, Friday, am I ever glad to see you. Last night Olivia had what we assume was some kind of stomach virus and it was just awful. Watching your babies suffer and knowing that there's nothing you can do has to be the most helpless feeling in the entire universe. Parenting is hard and just plain exhausting sometimes, y'all. Yoooou guuuuys, Target’s dollar spot is amazing right now. They have the best stuff for Christmas, and if you have a little girl, you must go snag some of these glitter bows… they are only $1 and you get two of them. Bows are usually so expensive, so you can imagine my surprise when I saw these babies staring back at me. They were begging me to take them home. The best part is that they are on alligator clips (my favorite) and they are very well made. I half expected them to fall apart when I picked them up, but they are legit. My only complaint? That they didn’t have them in more colors. I, like most of you ladies (I would imagine), use body wash instead of traditional soap, and ever since my favorite one was discontinued about a decade ago, I haven’t found a particular brand or scent that I love enough to stay loyal to. 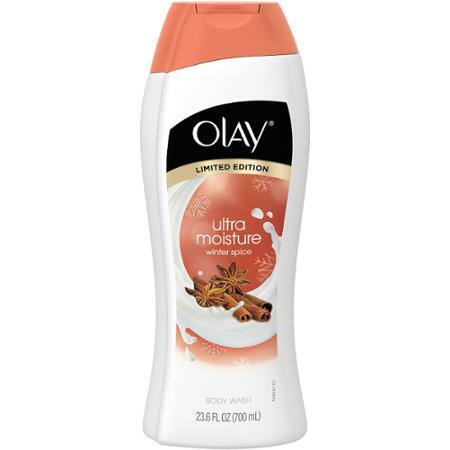 The other day while perusing the body wash aisle at Walmart, I came across Olay Ultra Moisture Winter Spice Body Wash and I was intrigued. It didn’t smell super special or impressive in the bottle, but I figured I would “give it a whirl” like Kevin McCallister and I tossed it in the cart. Y’all. It smells so good! And not in a traditional super perfumy Bath and Body Works kind of scent, but in an understated, super fresh scent with the slightest hint of cinnamon. And for some reason it reminds me of the way my Momma used to smell right after she got ready for the day when I still lived at home. I’m completely hooked, but I’m sad because it’s limited edition for the holidays. So the question is, should I load up on enough to last until next Christmas, or should I continue my search? The cube decorating contest is on at work! A few of us love to decorate our cubes and have been doing so every year for the last decade since I started working here (holy moly that makes me sound old). This year, however, a few more have joined in and everyone is giving a whole new meaning to decking the halls. It looks like Clark Griswold has been all up in here, y’all. And while I am a traditionalist for Christmas décor at home (think reds, greens, golds, and silvers), at work, I love having an excuse to use non-traditional colors. 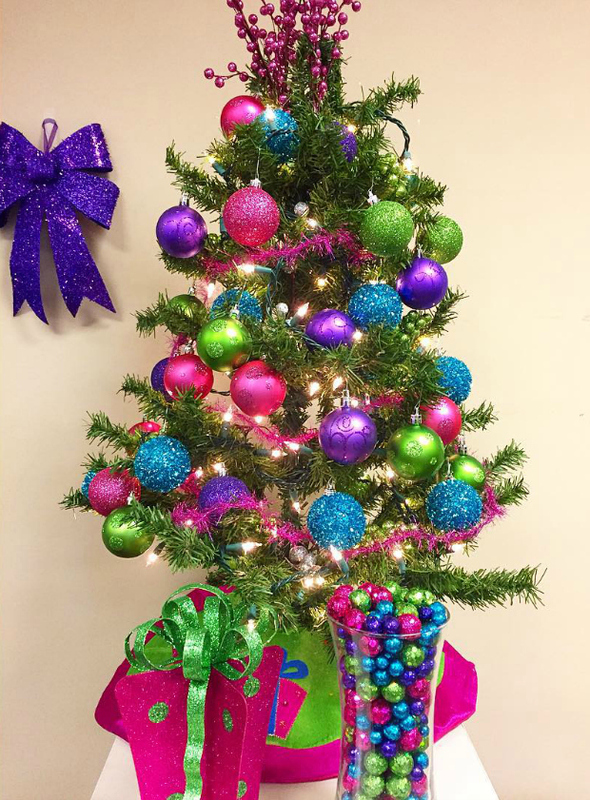 For the last few years I’ve decorated in hot pink, purple, and lime green, and this year I also added blue to the mix. Isn’t it cute? Last weekend I painted my nails gold. 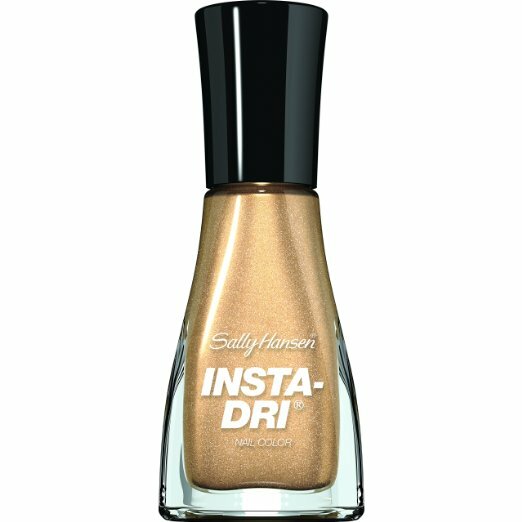 I tried a new polish, Sally Hansen Insta-Dri Nail Color and this stuff is amazing. My nails literally dried in 60 seconds as stated and it lasted five whole days before chipping too badly. 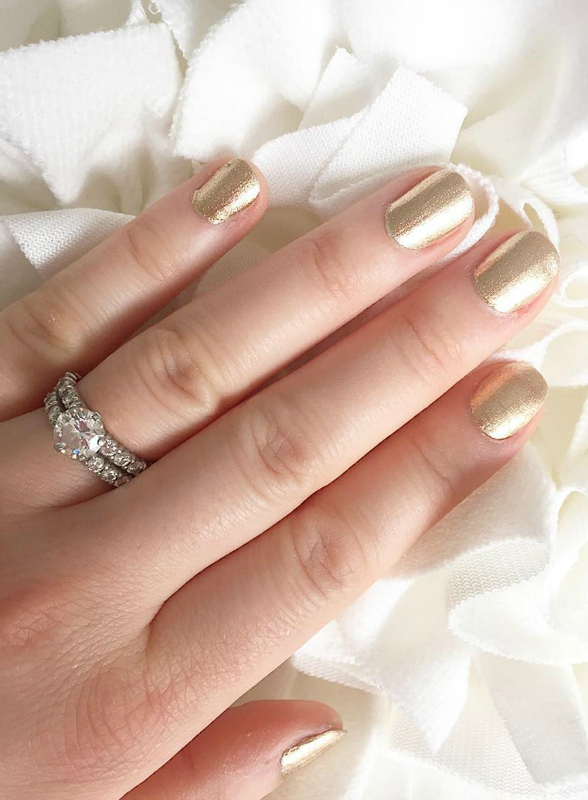 The gold coloring is perfectly metallic and shimmery without being overly glittery (even though I do love a good gold glitter polish) and it never dulled during the five days that I wore it. I love it. My only complaint? It was nearly impossible to take off. It took a ton of polish remover and scrubbing to remove it. Is it worth it? Totally. And it’s absolutely perfect for the holiday season. The other day I pulled out our Christmas boxes at home and started sifting through the decorations, and I was so delighted when I opened one of the boxes to see a gorgeous cream and gold damask sherpa throw that I had bought on clearance at the end of the season last year. I had forgotten all about it, so it was such a nice surprise. It adds a little pop of Christmas to our couch, and it’s so warm and snuggly. I’ve used it every night this week! Now I just need a cute Christmas pillow to sit with it, and the couch will be ready. Girl, SO many things I love! Gold polish? Sign me up and it looks gorgeous on your hands! Going to get that body wash today, hope target has it! Speaking of target, dying over that $ section! It's incredible right now ha! happy friday babe! Our Target $ spot has some awesome things right now but not those bows! So jealous! And your cube decor is totally on point! I'm usually a traditional decorator but I love those colors so much!! They probably sold out super fast!! Our Target didn't have very many left, so by now I'm sure they're all gone. And yes, at home I always stick with the traditional colors, so it's fun to change it up at work! I seriously buy something from the Target Dollar spot every time I walk in there now, haha. At least it is only a dollar (or three). Love the bows. Also, the gold nails are gorgeous!